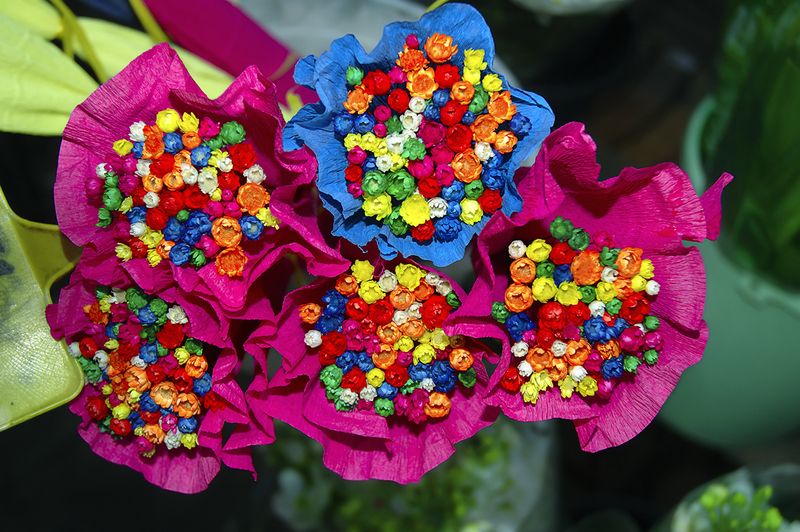 In trying to keep the colorful posts cause I think most of all like bright colors, at least that's my impression, I chose a bunch of small paper flower bouquets on sale at the stalls along Rambla dels Flors. I am not happy with the level of detail, that is, upon taking a very close look at the flowers but it was almost dark, I had to fire my flash, ask for permission to shoot, watch not to be shoved onto the flowers by passerbies, hold one cigar in my left hand which the stall owner asked me to keep an eye on and last but not least finish fast so my wife and daughter didn't get too tired of waiting. Apesar desse trabalho todo conseguiste de facto uma excelente fotografia, bonitas cores, muito bem. Muita bonitas as flores e as cores! After such a grey day here, it is so nice to see bright colors. Muchisimas gracias, Carlos!